Having a heavy stocking rate makes the least profit and causes degradation of pastures. The heavy stocking rate also increases runoff and sediment loss compared to a range of improved grazing management strategies. Grazing management and stocking rate relative to seasonal pasture growth influence the profitability of and water quality from North Queensland Dry Tropics grazing lands. A trial funded by Meat and Livestock Australia and the Paddock to Reef program in the Burdekin has investigated animal performance, pasture composition, land condition and runoff water quality for 14 years. This includes periods of drought and wet years. The objective of this project is to assess the relative performance of different grazing strategies in terms of profitability, pasture condition and runoff. This long-term grazing trial is located at Wambiana Station near Charters Towers. The land condition of the site at the beginning of the trial in 1997 was fair (B condition, using ABCD condition assessment). Heavy stocking rate, at twice the long term carrying capacity. Moderate stocking rate, at the long term carrying capacity of eight hectares per animal equivalent (AE). Variable stocking rate, with stocking rates adjusted in May based on available forage - stocking rates ranged from four to 11 hectares per animal equivalent. Southern Oscillation Index (SOI), with stocking rates adjusted in November based on available forage and southern oscillation index based seasonal rainfall forecasts (ranging from four to 11 hectares per animal equivalent). Rotational wet-season spelling (R/Spell), at 1.5 times the long term carrying capacity. The paddocks contain a mix of soil types typical of the region and are on a low slope. Data is collected annually on cattle weight gains, pasture condition change, and runoff and sediment loss. Measurement of runoff and water quality occurs via flumes on one hectare plots located on a texture-contrast (Sodosol) soil type. There were only small differences in the sediment concentration in runoff between the management strategies, possibly due to the low slope of the trial area or the relatively high percentage groundcover. However, there were noticeable differences in the runoff volumes and number of events. As the total loss of sediment is a result of the sediment concentration times the volume of runoff, this means there were differences observed in the total sediment lost between treatments. The heavy stocking rate made the least profit and caused degradation of pasture to C land condition with increased runoff and sediment loss. 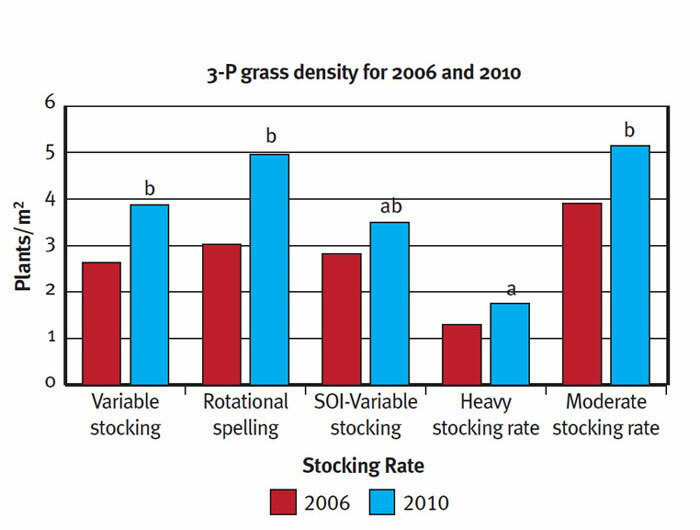 The moderate stocking rate (at long term carrying capacity) was far more profitable than the heavy stocking rate and maintained pasture in B+ condition. This resulted in fewer runoff events and less overall sediment loss. The variable stocking rate and Southern Oscillation Index based rate were also as profitable as the moderate stocking rate, but were economically riskier with greater income variability; these strategies also resulted in slightly poorer (B-) pasture condition. 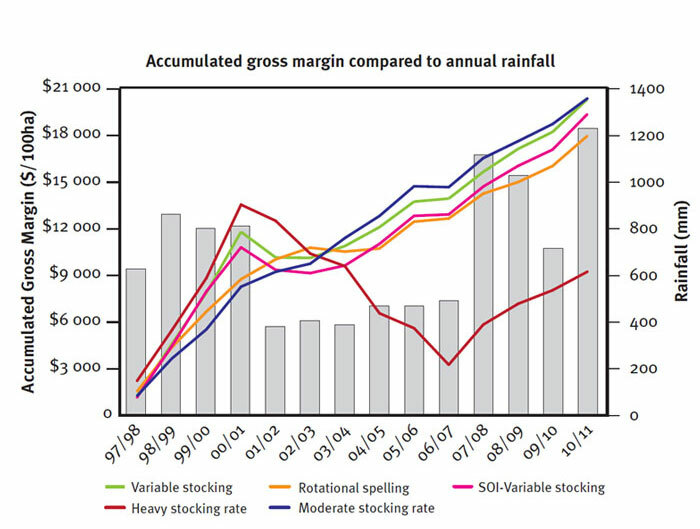 Rotational wet season spelling (with moderate stocking) was almost as profitable as the moderate stocking rate and also maintained pastures in B+ condition. The number of runoff events was also reduced compared to the higher stocking rate. Cattle production was good under all management strategies but the overall profitability of the heavy stocking rate strategy is still far behind that of the other treatments. Although ground cover is high in all treatment paddocks, land condition (indexed by the density of 3-P - palatable, perennial and productive - grasses) is still poorest on the heavy stocking rate strategy. The heavy stocking rate resulted in significantly worse pasture condition compared to other treatments except the southern oscillation index variable stocking rate, as shown by the superscripts above 2010 values (bars with the same letter above (i.e. b, ab, a) are not statistically significantly different at a 95 per cent confidence level). Measurements will continue to be taken at this site using industry funding from Meat and Livestock Australia until at least 2013. Star M, Donaghy P, 2009. Enhancing economic input to the CQSS2 project report. Commissioned by the FBA through NHT2 funding. Rockhampton: QLD Department of Primary Industries. Star M, Donaghy P, 2010. Economic modelling of grazing systems in the Fitzroy and Burdekin catchments. Report to the Fitzroy Basin Association through funding from the Australian Government’s Caring for our Country, and Paddock to Reef Monitoring and Modelling Program. In: Queensland Department of Employment, Economic Development and Innovation (ed.). The Lyons family of Wambiana for their ongoing advice and support in running the Wambiana grazing trial. Peter O’Reagain and John Bushell (Queensland Government Department of Agriculture, Fisheries and Forestry).